Enjoy 3 unique operating configurations with the 17x17 hybrid, including full wireless, wired power connection, and wired (fixed) power and data connections. Providing the most in versatility with exceptional image quality, and paired with advanced software features and functionality. Taking digital radiography to the next level with our 17x17 Hybrid Flat panel technology is 2020 Imaging’s cassette-sized FPH. Enjoy 3 unique operating configurations, including full wireless, wired power connection, and wired (fixed) power and data connections. Providing the most in versatility with exceptional image quality, and paired with advanced software features and functionality. 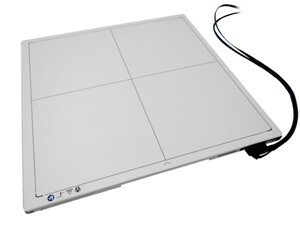 The 17x17 hybrid panel uses enhanced Cesium technology and has many unique features such as device-drop notification emails. • Imaging Area - 17" x 17"